Performing what-if analysis in business is very common, crucial even. What if a new project is delayed by 3 months? Or what if the company is unable to secure financing at the projected cost of capital? Successfully answering questions like these often means the difference between a business finally turning the corner and becoming profitable and, well, it not. But this type of analysis is also helpful for individuals. Far from overly complicated but seldom used by consumers, tools that allow for thoughtful consideration of important personal finance decisions should be used much more often then they are. They can help one understand how much more a car will cost over time or what term and interest rate combination is required to make sure the monthly payment fits into the family budget. They can even reveal how your credit scoreis helping or hurting you. 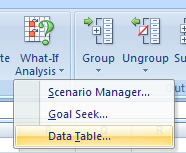 Data Tables, one of the features in Excel's What-If-Analysis Package, is a very useful tool for comparing. If I had a dollar for every time someone asked me “what the heck are those dollar signs for?,” I’d be a millionaire. Well, anyone worth their weight in gold as an Excel user should really understand what those pesky dollar signs are used for. It’s really pretty simple. The inclusion of dollar signs ($) in a formula changes at least part of the cell reference from relative to absolute. Let me explain. You see, Microsoft Excel is a very, very powerful tool. So powerful, in fact, that more times than not, it tries to help you get your work done faster and more effectively, even attempting to save you, the user, from yourself. Like auto-numbering and spell-check in Microsoft Word, this type of “help” is what we’ve come to expect with Microsoft products. So when you copy a formula for use somewhere else in your worksheet, which I’m sure you’ve done, Excel assumes that you want to keep the same relationship.